This song is from 1954 film Nagin (Female snake). It is believed that snake charmers hypnotize snakes with a multi-frequency reed instrument, and sometimes snakes even dance to the music. Here metaphorically speaking, heroin is mesmerized by the same instrument like a snake would. This is the most popular song ever. Even today’s kids recognize the music after 60 years. One of the few songs where the music in the song is more popular than singing part. People hum along with the music. This has become a template song for all the snake charmers for last 60 years. I haven’t seen any snake charmer not playing this song. 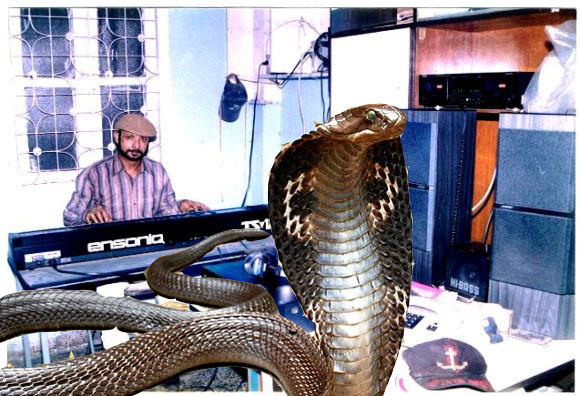 Now the big surprise: This music is not played on Been (snake charmer’s flute). It was played on early multi-instrument electric keyboard called ‘Clavioline’ + Harmonium. I have used my synthesizer to play the music. I have also put the link above for the original song so you can compare. Music composer for the film was Hemant Kumar. All the songs became big hits, or rather immortal songs. There has been big debate about who played this snake charmer piece. Hemant Kumar had two assistants: Kalyanji and Ravi. They both had major contribution to this piece. After searching on google, I found that neither of them originated the main composition. It was composed by a musician from Goa (at the time under Portuguese rule ) Lucila Pacheco. She was a pianist and sax player, who became musician for Bollywood. She composed the original tune on piano for Hemant Kumar. It did not sound Indian enough. So Ravi, modified it on his Harmonium. Later Ravi on Harmonium and Kalyanji on Clavioline jointly played the final version to make it sound like snake charmer flute. Both these assistant music composers became legendary composers of Bollywood, soon after release of this film; with the blessings and encouragement of Hemant Kumar. How many composers now a days would encourage competition? They were the true artists by heart. The lyrics part is sung by Lata Mangeshkar, who does not need any introduction. One of the very few songs where the music part was more popular than the singing part. There have been many myths about this song. One: People actually saw snakes appearing in theaters while the music was on in the film! This entry was posted in Art-Oasis, Been, Belly Dancing, Bollywood Oasis, Club_Oasis, Ghanshyam Thakkar, Hemant Kumar, India Music, Instrumental Music, Instrumental Remix, Kalyanji Anandji, mov, MP-3, MP4, Music, Music Remix, Music_Oasis, Music-India, Oasis Thacker, Oasis_Music, Snake Charmer's Music, Video, You Tube Video and tagged Instrumental Music Remix, MP3, Music, Oasis Thacker, Snake Charmer's Music, Viewpoint, You Tube Videos. Bookmark the permalink.